Completely in keeping with its time, the Oceanis 35 adapts to different lifestyles at sea and throughout life. The ocean’s your playground with this evolving cruiser. Made for cruising single-handed or with family and friends on seas the world over, she always delivers great speeds. The Oceanis 35’s chined hull offers particularly surprising cruising comfort. Good and taut to aft and low on the water, the rigidity under sail of this cruiser takes her further and faster, with exceptional stability. It is a real joy to have two helm stations, a mainsail arch and a huge swim platform on a sailing yacht this size. 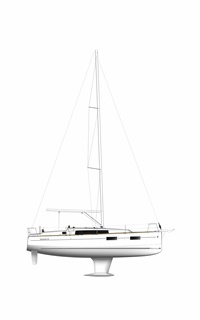 The Oceanis 35 comes in Daysailer, Weekender or Cruiser versions, which maintain the possibility of a later evolution in terms of living space organization. Like a floating loft, open in every respect, even the layout of its cockpit, this version offers very generous space inside in an unpretentious fashion. The comfortable companionway opens into a single space, with absolutely no bulkhead. An evolving yacht par excellence, this version offers a choice of layout with either two or three cabins. There is great freedom of layout: open or closed cabins, separate shower compartment, fitted galley, extra indoor/outdoor table, helm seats, and so on. 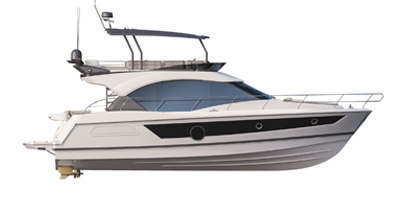 Much closer to the cruising tradition, the Cruiser version offers a choice between two or three bulkheaded cabins. However, this decision is never irreversible, since the partition closing off the fore cabin can be removed. This ability to open up space allows you to adapt it to the loft spirit of its sisters. You will love the large fitted galley opposite the saloon. Twin steering station, slatted wood helmsman's seats on option. According to preference: with or without aft swim platform, for an open cockpit or a drop-down swim area for a cruising programme. Open fore cabin - loft style (berth for 2 people). Gently sloping 45° saloon companionway. Open loft-style saloon, chart table facing companionway. Large storage space to the stern accessed by the cockpit as well as hanging locker. Open fore cabin - loft style - large aft cabin (berths for 4 people). Open fore cabin - loft style - two aft cabins (berths for 6 people). Private fore cabin - aft cabin - pouffe and double berth on option in the saloon (berths for 6 people). Bathroom with toilet and separate shower on option. Cruising layout saloon, removable table. Private fore cabin - two aft cabins - pouffe and double berth on option in the saloon (berths for 8 people).